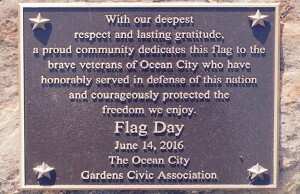 On Saturday morning while many prepared to hit the beach, the Ocean City Gardens Civic Associate held a service to honor our Ocean City Veterans. The event was highlighted by the dedication of a bronze plaque, located near the foot of the Longport Bridge, honoring all those who have served in the Armed Forces. 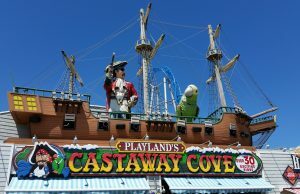 The sun was shining and a brisk wind whipped across the entrance to Ocean City setting the stage for a memorable event. Approximately 50 people attended the ceremony. Many in the crowd were veterans themselves and members of our local VFW and American Legion. Others were there out of respect for the great sacrifices endured by our military personnel. The Dean Randazzo Cancer Foundation had its most successful event to date, raising nearly $100,000, at the 9th annual Paddle For a Cause presented by J&L Amish Depot on Saturday, June 11. The foundation has collected a little more than $96,000 in donations with funds still being counted according to the board’s treasurer Kristi Collins of Somers Point. 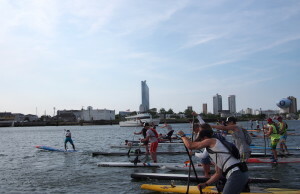 Each paddler was required to raise $200 to participate in the event. Hailey Parker would have loved it! Hundreds of people got together for a great cause and had fun doing it. Awareness was raised about pediatric cancer, and more than $12,500 was raised for pediatric cancer research. Ocean City students who rode their bicycles to school on Monday (June 13) found something different on their bikes for the ride home. While they were at school, volunteers from Bike OCNJ installed free bicycle lights for safe riding after dusk. 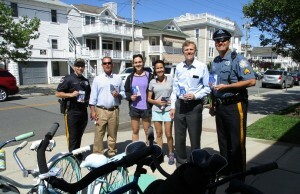 Bike OCNJ added the small lights on elastic bands to all bicycles parked outside Ocean City’s three schools on Monday. 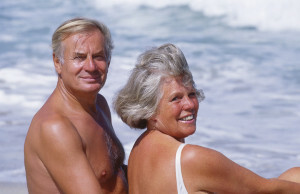 They will return on Tuesday. The lights were placed at the front (white) and rear (red) of all bikes. 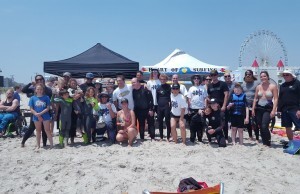 The Heart of Surfing event, held Saturday afternoon on the 7th St Beach, was the most successful yet both in participation, and fundraising to aid children with autism. The event, now in its third year, included a conventional surfing contest and surfing sessions for special needs individuals. Volunteers assisted the special needs participants in catching waves, standing on the boards, and sometimes riding tandem. 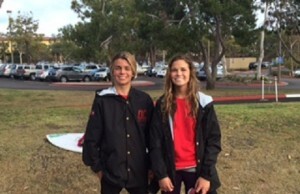 Congratulations to Aspen Lawler and Nick Brady as that move on to the second round tomorrow and Dylan McGuckin who surfs long board tomorrow on 1/4 finals. Go OC!!! Exactly once a year, dogs are welcome on the Ocean City Boardwalk. Not only is that fact alone special, but the presence of the canines helped to benefit an outstanding cause, the Humane Society of Ocean City. 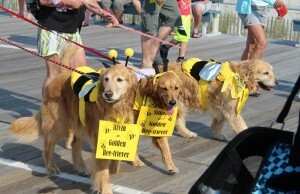 The former “Barks on the Boards” parade was re-launched on Saturday as “Show Us Your Paws,” a play on the famous “show us your shoes” mantra of Atlantic City’s Miss America Parade and Ocean City’s own Miss New Jersey Pageant parade.